A “uniquely personal” approach to intro psychology! 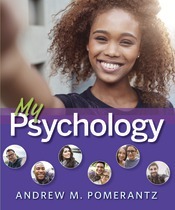 One of Andrew Pomerantz’s goals in writing My Psychology was to make the science of psychology immediate and relevant to college students. Check out these features that help students apply psychological concepts to their lives. Fresh examples that engage and relate to the modern college student. In the Motivation and Emotion chapter, many textbooks use the example of a wild animal attack as an event that triggers a strong emotion. My Psychology uses the example of water spilling a on a cell phone. Chapter 3: Variety, the Key to Happiness? Chapter 4: Do You Realize What Sleep Deprivation Does to You? Chapter 8: Does Money Buy Happiness? Chapter 10: Does Gaydar Work? Chapter 12: What's Happening to Our Locus of Control? Chapter 14: How Powerful Are Magazines in the Development of Eating Disorders? Life Hack mini-features offer direct suggestions to students for how to improve their lives according to the findings of psychological research. These 1- 2 sentence tips steer students toward higher levels of well-being, productivity, and other desirable outcomes. It's Like... features use the power of analogy to help students understand concepts that may be unfamiliar but share important similarities with concepts they already know well. Watching Psychology features use popular TV shows and movies to illustrate key concepts. Chapter 3: More Touch, More Wins? Chapter 4: What (Body Clock) Time Is Kickoff? Chapter 5: The Serial Position Effect on American Idol? Current Controversy features encourage critical thinking and an appreciation of the scientific process by introducing students to ongoing debates and disagreements within personally relevant areas of psychology. Chapter 1: Should Psychologists Prescribe Medication? Chapter 3: Can Your Retina or Iris Unlock Your Smartphone? Chapter 4: Should High School Start Later in the Day? Chapter 5: Do Sports Injuries Cause Memory Loss? Chapter 6: Does Violence in the Media Cause Violence in Real Life? Chapter 7: What is Texting Doing to Language? Chapter 9: Social Networking and Computer Gaming: Good or Bad for Adolescent Development? Chapter 10: How Does Facebook Affect Body Image? Chapter 11: What Counts as a Trauma? Chapter 12: Is There an Upside to Neuroticism? Chapter 14: Premenstrual Dysphoric Disorder? Chapter 15: Therapies that Work ... for Whom? Student dialogue questions, easily distinguished in the text with a colorful font and icon of a raised hand, anticipate students' confusion or common questions and provide clear-cut answers.